Magazine and newspaper writers envision a world of digitally-connected readers hanging on their every word. Despite the ubiquity of connected devices, from smartphones and PCs to tablets, that’s not currently the case. Fewer than half of online adults regularly read a magazine, newspaper, or periodical using any one of these connected devices. Also, while Apple’s customers are more active digital readers than most, Apple’s News+ service is being launched into a chilling headwind. This is based on results from our TUP/Technology User Profile survey of 14,273 adults across five countries. 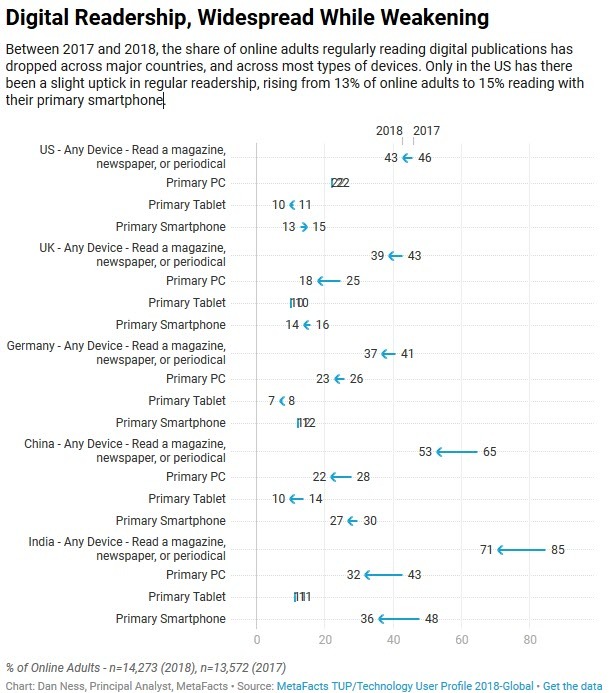 Only in India and China do the majority of online adults regularly use any of their devices to read periodicals. In the US, UK, and Germany, this rate is nearer to four-tenths of online adults. Active readers are appearing to favor convenience over multi-device accessibility. Across the countries surveyed, nearly two-thirds of active digital readers do so with whichever of their devices is their primary device. Also, it’s not as if even active readers do their reading across multiple types of devices. Instead, the net number of active readers is close to the sum of readers using their PC, tablet, or smartphone. No single device stands out universally as the digital publication reading favorite. PCs are a favored reading device in the US, UK, and Germany. In China and India, slightly more choose smartphones over PCs. The image of magazine readers sprawling on their couches, kicking back with their iPads to catch up on a beautifully graphical long read, only represents a small part of the market. Tablet news-reading is only done by a few. Across the five countries surveyed, only around one in ten online adults use a tablet for such reading. Part of this single preferred-device approach may be due to the inconsistencies between publications across platforms. While some publications design for a large-screen experience, others aim for the smaller screens of a smartphone. Yet others haven’t seemed to do much aiming or development, seemingly settling with exporting PDFs of their printed pages. Using connected devices to read subscriptions has sagged in the last year. Across all the countries surveyed, regular readership rates have dropped. The reduction has been most pronounced in India and China, dropping from 85% of online adults to 71% in India, and 65% to 53% in China. Service such as Apple’s recently announced Apple News + may help to change that. Making subscribing easier through a simplified app and bundled price may just raise the number of active digital readers, if not also subscription rates. Because Apple’s service was launched to only run on an iOS or MacOS devices, this a subset of the entire market. However, this subset is sizable. As of mid-2018, TUP finds that Apple has 100.3 million adults in the US actively are using an iPhone, iPad, or Mac, which is 46% of all online US adults. This rate is similar among online adults in China (50%), and lower in the UK (44%), India (35%), and Germany (23%). Apple’s customers are above-active readers. Among Apple’s customers, there is a higher rate of actively reading digital publications than among the general population. 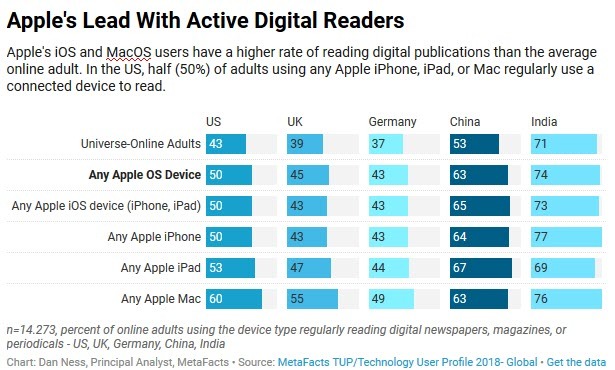 Half (50%) of users of any Apple iOS or MacOS device (iPhone, iPad, or Mac) in the US regularly use a connected device to read digital publications. 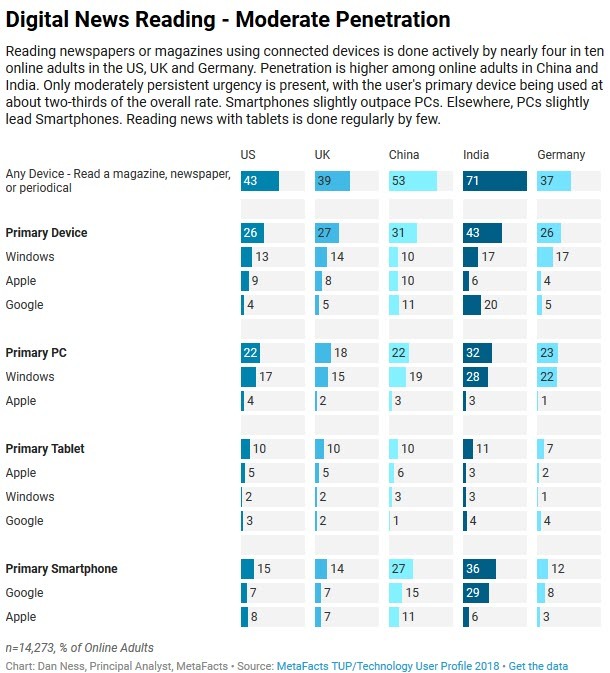 Across the UK, Germany, China, and India, the pattern is the same: more of Apple’s users are active digital readers. Services like Apple News+ will likely be good for Apple and moreover good for Apple’s customers. Since Apple’s customers are already above-average readers, we expect subscriptions to be strong. In addition to the revenue flow to Apple and publishers, it could help deepen the connection and loyalty Apple’s users have with its other offerings – services and devices alike. On first glance, services like Apple News+ may not seem attractive to publishers. 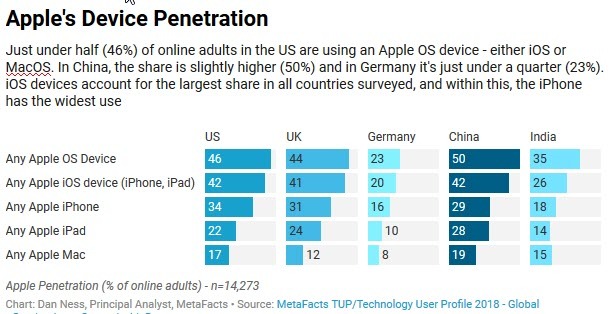 If they view their TAM as only around half to a quarter of online users (Apple’s current foot print is 50% in China, 46% in the US, 44% in the UK, 35% in India, and 23% in Germany) this might seem like a glass-half-empty approach. Were Apple enable Apple News+ to more platforms beyond iOS and MacOS, the next-largest active-reader platforms are Windows PCs and Android smartphones. While this would likely entice more publishers, it might threaten Apple’s exclusive experience within its platforms. Also, for these platforms, Apple may need to make extra efforts to fulfill its promise of subscriber privacy. However, to the extent publishers consider such a service as bonus readership, this may entice them and others to join. Apple’s customer base continues to have a higher than average socioeconomic profile. And, as Apple continues to roll out additional subscription services such as movies and TV, many customers will likely expand and deepen their connections and loyalty to Apple. Also, we expect more readers to return to reading as they discover the digital experience to be more enjoyable and straightforward. The analysis in this TUPdate is based on results drawn from the most-recent wave of TUP (Technology User Profile), the 2018 edition which is TUP’s 36th continuous wave. This survey-based study details the use of technology products by a carefully-selected and weighted set of respondents drawn to represent online adults. This specific wave spanned the US, UK, Germany, India, and China. In the TUP survey, we identified the connected devices being actively used, from desktop tower PCs, to all-in-one, notebook, and convertible PC form factors, to tablets, smartphones and basic feature phones. For the four devices used most often, we asked respondents to choose from among 71 activities that they do most regularly with each device.